Can’t you relate. Pluses and negatives of having curly hair. I came across a fellow curly girl’s website. In her post on Lovelyish.com she describes the various perks and pitfalls of having curly hair. As I was reading her article, I found that I could relate to every single plus and negative. It was hilarious. I encourage you curly girls to visit her page. I am sure you will relate to at least 85% of what she is saying. It made me feel proud of my curly hair, but also made me feel like I was part of a bigger community. Having curly hair can sometimes seem like a burden. The girls that had no one there to take care of their hair as youngsters probably wished so much that they had straight hair. Like me, and many other curly girls, learning how to maintain our hair has made it so much easier and pleasant to deal with. Pitfall #1: Many hair style tutorials don’t apply to you. While we master the big curls look, that’s just about all we can do. I can’t tell you how many cute hair tutorials I want to try but can’t because, well, I can’t exactly replicate the look with my hair. It can take us a split second to do a high bun or even a side ponytail, but anything requiring blow drying and straightening will turn into a grueling process for us. Some of us curly girls are fortunate enough to grow long hair, but some curly girls struggle getting the length that they want. It is like your hair has reached a limit of growth which it cannot pass. Do you think life has given you the “short” end of the stick. Understand that every person has a “terminal length.” Hair grows for a certain amount of time before it falls out (about 7 years). People’s hair grows at different speeds, which results in different hair lengths. If you notice that your hair always stops growing after it has hit a certain length, then this is your terminal length. On the other hand, hair growth can be stumped by other factors. Your hair is capable of growing more without the annoyance of constant split ends, which you have to cut. Another factor might be that you find it hard to properly care for it. I’m here to tell you there are many things you can do to achieve long beautiful curls. 1. As i mentioned before, make sure to keep your hair well moisturized. Condition well while hair is wet. In my previous posts I explain how shampooing your hair too frequently can strip the natural oils in your hair. Continue to follow my advice. If needed, wash your hair with only conditioner on the days you go without shampooing. 2. Avoid damaging products. If you really want to start the journey to getting longer hair you must avoid straightening or dying it. This can dry your hair and give you split ends. If you absolutely need to straighten your hair, restrict it to only a few times a month. Check out my post about naturally curly hair and professional hairstyles to learn how to style your hair naturally. 3. Trim your hair only when necessary. It is a myth that cutting makes hair grow faster. Trims are only beneficial for the health of your hair if you need to cut split ends. In the event that split ends do appear, you are fine trimming 1/4 or 1/2 an inch. 4. Use treatments like hair masks (check out Hair masks)” to replenish the moisture in your hair. Use coconut or olive oil for the ends of your hair because the oils in your scalp do not reach the ends. 5. Eat healthy and take vitamins. Drink enough water! I love what is going on in this picture! Alicia Keys is showing off her beautiful curls, something she does not do often. She has her hair pulled up into a ponytail and accented the sides with braids. This look can be tried by you. It is simple but cute. If you girls are tired of doing the same old styles, try this funky one for a change. Here is a step by step process on how to achieve this look. 2. Make three parts with the front of the hair that you left out. The side parts will be where you braid your hair and the middle part will be the Mohawk part. Put the middle part into a ponytail or bun for now so that is out your way. 3. Part and cornrow the sides of your hair. Make as many braids as you want. Cornrow from the front of your hair to the crown of your head. 4. Now, take the mid section of your hair and pin it to make an illusion of a Mohawk. You can do this by pushing up the hair. 5. Grab the rest of your hair and make a ponytail. To define the curls use gels or mousse. Don’t forget your roots. Try these professional hairstyles for work. It is often heard that curly hair should be straightened to look more professional. There is a common view that curly hair looks too untamed and wild for a professional setting. For those of you who spend so much time straightening your hair to keep your boss happy, I am here to tell you there are options. There are several hairstyles that are acceptable at work, but stays true to your natural ways. 1. The bob is a great look. It shows off your curls while giving you a professional grown up look. This might be a good choice for you. Maintaining a bob requires frequent visits to the hair salon to get cuts, which in turn will make your hair healthier. This cut is good for square, oval, and long faces. 2. Braids can look anywhere from casual to elegant depending on how you dress it up. It is tamed and tucked away from your face giving you a clean look. For long hair braids can be trendy and look very appealing at work. 3. High buns are my favorite. It is easy to create and can be done if you have no time to do anything else with your hair in the morning. what’s best about the bun is that it is so effortless but at the same time it can look so elegant. 5. Hair accessories can be fun. Anywhere from bobby pins, to head bands, and much much more, you can decorate your hair to make it look lavishing. There are so many bows, ribbons, and ties you can choose from to create the exact look that you want. I found this creative hairstyle on Pinterest while searching for new looks to show you guys. Even though the girl in this tutorial is not a curly girl, this is still a great look that we can all pull off. It is easy to do and is not time consuming at all. This is great for when our curls aren’t cooperating. When we want to just tie our hair up, this would be a fun way to approach the bun. Try it out! “1. Take a one inch section on top of your part and split into three. This is the start of the Dutch braid (or inside out braid). 2. Cross the right piece under the middle, then the left piece under the right, forming a braid. When you cross the middle section under, add in some hair. 3. Continue braiding and only add in hair on the right side. So when you cross under from the left side you don’t add in any hair. Angle your braid along your hairline and over the top of your ear. Stop adding in hair when you pass your ear. Finish the braid and secure with a small clear elastic. 4. Stretch out your braid! To get this big dramatic braid, you need to gently pull at the sides of your braid to widen it. 5. Gather the rest of your hair into a side ponytail, next to your braid. 6. 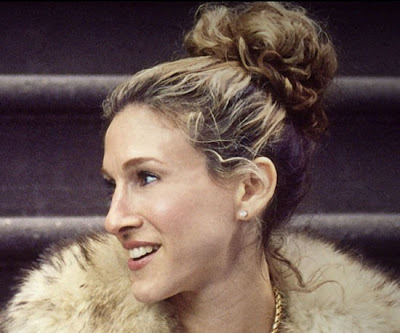 Use a hair donut to create a large side bun. 7. I teased my ponytail to make it bigger before wrapping it around the padding and pinning underneath. 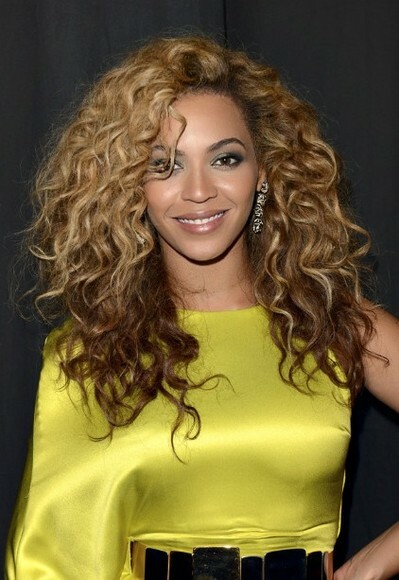 Here is some inspiration for all you curly hair girls to remind you how beautiful your hair truly is! Have you curly girls ever been frustrated by your tangles? I sure have. It is so easy for the hair in the back of our heads to become knotted. The pain that comes along with vigorously brushing the tangles is annoying. But don’t give up just yet. There are things you can try that will lessen your burdens. First off, I hope you comb your hair! Having curly hair may be challenging sometimes. There are many of us who cannot go one day without combing because our hair turns into brillo pads. I am fortunate enough to have hair that is on the thinner side, therefore I am able to wrap my hair up for a couple of days and not worry about combing. After those couple of days I know my hair will not be too impossible too handle… as long as I have conditioner. For you curly girls that have a hard time combing through your tangles, I got a solution for you. The best way to comb knotted curly hair is while it is wet. When you brush dry hair you can potentially break hair strands and create more frizz. While your hair is wet, add a generous amount of conditioner and spread thoroughly. There is no such thing as over-conditioning. While the conditioner is in your hair, use a wide toothed comb to brush the knots out. Start from the bottom of your hair and work your way up. Never start at the top. After combing, rinse the conditioner out. If you suffer from severe tangles and conditioning alone does not help, add a leave-in conditioner to your hair. If you are going out, style your hair as usual. If you are staying in or going to bed, leave your hair in a braid. You can improve the health of your hair by making sure you ingest the right vitamins! Vitamins are in many of your common foods and can improve the quality of your life. Not only does it help with your immune system, nail, and skin, but it also has many benefits for your hair. What you can receive from vitamins is thicker, shinier, and smoother hair. Who doesn’t want that? Here I will explain the different types of vitamins and what its benefits are. Most vitamin B’s are important for hair growth. These are B3, B5, B6 and B12. B3 (Niacin) is essential for a healthy scalp with good circulation. You can find B3 in fish and chicken. You can find B5 in eggs. B5 can prevent grey hairs. Helps with the appearance of hair. It helps with oil production and is very essential for the scalp. Vitamin E is found in soy beans, nuts, and beans. This article I found in Naturallycurly.com gives helpful hints to achieve shiny and smooth hair. 10 Tips to Get Smooth and Shiny Hair. Smooth and shiny curls can seem like they are miles away when you are first figuring out what products your curls like. Even those curlies who have been natural for years can still have trouble battling their frizz. We’ve put together a list of 10 tips and tricks that can give you that smooth and shiny hair you’ve been waiting for. Take care of those curls: It can be hard to completely embrace your natural look, but once you ditch the straightener and any other method that damages your hair, you will notice a huge change in the health of your hair. You will start to notice less frizz and damage, and instead you’ll see shine and have smooth curls. Condition often: Conditioner is key to get the smooth and shiny look you are looking for. Find a conditioner that your hair absolutely loves and run with it. Remember, there are many people who only wash their hair with conditioner for a reason! Be careful with that comb: If you comb out your hair, start at the bottom and work your way up. Starting at the top can cause breakage and damage which leads to frizzy hair. Many people with curly hair only finger comb their hair, but if you do use a shower comb, be careful how you use it. Give your hair a break from heat: Most curlies know that heat can cause some serious damage and lead to some serious frizz. If you diffuse your hair often, use a lower heat seating to keep your curls from being damaged. If you decide to use a straightener, make sure you find a heat protector that will do a good job at keeping your hair healthy.